Toss frozen strawberries, raspberries, blackberries and frozen sliced bananas in it, few at a time and pick them up with fork. When the fruits thaw, these chocolate balls tastes like Lindt chocolate; chocolate crunch and cream inside. I also make some spiced ones which are my favorite. After the fruit ones, put a stretch film in a small plate and pour the rest of the chocolate in it. Add cayenne pepper, orange zest, chopped almond ( soaked overnight and skin removed) and mini orange pieces with skin. Put it in freezer till it solidifies. Than broke them in pieces. You can use your imagination and put ANY SPICE, FRUIT OR NUTS IN THIS CHOCOLATE. When you use fruit make sure they are frozen so that coconut oil based chocolate can cover and solidify right away. 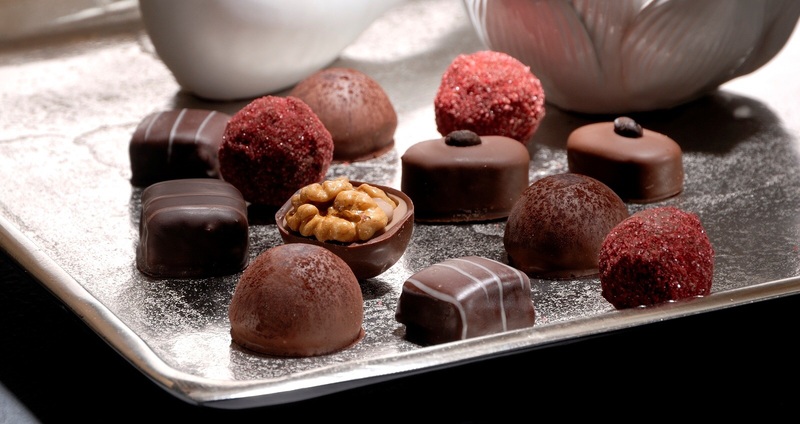 Use parchment or wax paper otherwise chocolate balls stick to plate and crack. I bought nice, bite-size, silicone molding tray. Now I can prepare my spiced and other nutty chocolate treats with this. I keep these chocolates in refrigerator since coconut oil melts at about 76F. Guilt free and good for you. Enjoy!